Figure right: This shows corrosion from liquid immersion that was left untreated. The entire display assembly had to be replaced. Getting it here quickly, would have made the difference. You may not understand quite how expensive these devices are. The 16GB version of an iPhone 6 costs $650. Your carrier sold it to you for $199 plus a 2 year contract. From the $40 a month for the data plan, $19 of that $40 retires the "subsidy" - the additional $450 you didn't put on the counter when you picked it up. After two years of paying the $19 a month, the debt or subsidy is paid off and you are eligible for an "upgrade". I'm not someone that would live without an iPhone and I don't think you are either. If your phone isn't fixed, you will have to pay off the $450/contract and then institute another one to get a new iPhone. There are two variations of liquid immersion work I do with iPhones. Working Phone: One is to make them work properly again. Data Recovery: The other is make them *just one last time* to get the data off the phone. I am able to make the 4 and 4S iPhones work post-immersion about 80% of the time. I am able to make the 5 and 5C iPhones work post-immersion about 65% of the time. I am able to make the 5S iPhones work post-immersion about 75% of the time. I've had just a few iPhone 6's here for liquid problems. I'm about 55% successful. I recognize your iPhone is the communication lens you see the world through and when a phone arrives everything else is set aside to solve it's problem. I never keep a water immersed iPhone here longer ONE day. I begin work on it exclusively the moment it arrives. If you send me $21 for return Express Mail shipping I will send it back using next day delivery the same day it arrives here... which means MAX 3 days out of your hand. 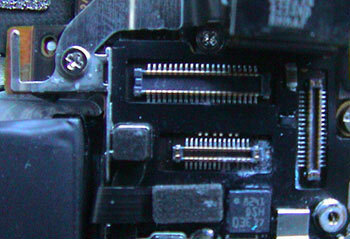 Figure right: This shows how corrosion on the logic board side, destroyed an iPhone 6. 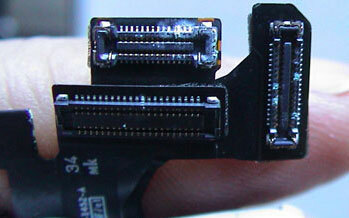 It couldn’t drive the LCD backlight because those connections had been corroded away. As of October 4th 2018, I am 8,236 successes and 1089 fatalities at iPods, iPhones, laptops, cell phones of all types and now iPads "dropped in water", "dropped in a Port-o-John at Floyd Festival" or "dropped in the toilet" (no... really), put "through the washing machine", "dropped in a river while I was crossing it with the iPad in my backpack" (that would be the iPad), "went into the hot tub", "forgot I was using it and went in the pool with it on", "bent over a pot of soup and it slipped out of my pocket" (chef), "got doused in Chloraseptic", "my bottle of sparkling water blew up in my gym bag", "my daughter dropped it in the toilet" problems. Call me to discuss what has happened to yours..... I'll bet I've heard it before and have brought an iPod back from that disaster. I charge $60 to go through a water immersed iPhone to get it to work. This is the "Working Phone" solution. Water cases are complex and successful on a case by case basis. I never know if I can bring them back to life or not until they are here and I examine and try. Sometimes it is merely a thorough processing of the device for corrosion which is just $60. Other times one (or more) parts has actually failed and needs to be replaced to bring it back to life. If I can't get it working perfectly you get the device back with a cash refund of $30 and the knowledge there was nothing on planet earth that would have gotten it working again.